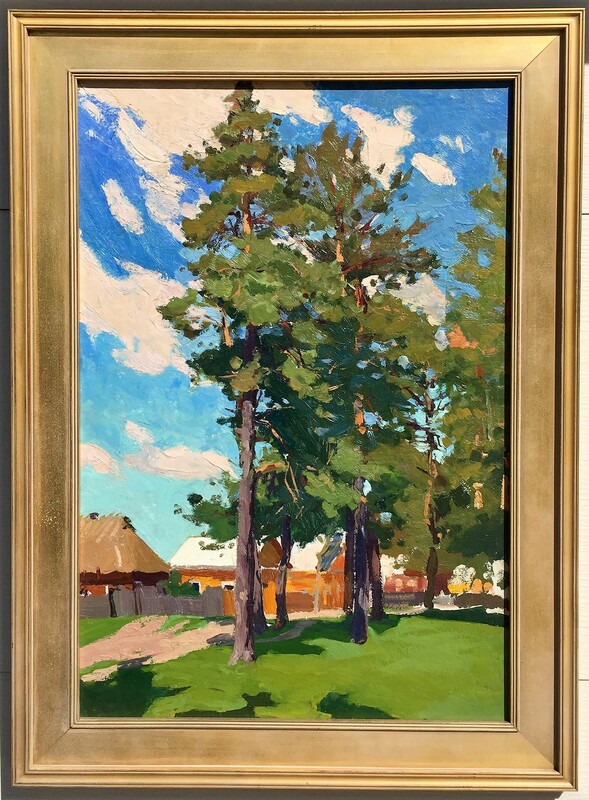 As our November silent auction selection, we are pleased to present a wonderful landscape, "Outskirts of the Village" by one of the premier landscape artists of the second half of the twentieth century, Mikhail Vasilievich Akinshin. Estimated at $3,000 to $4,000 the current bid is just $750! Akinshin had a unique ability to capture people as well as the beautiful landscapes of village life. He painted the countryside with emotion and reverence, always full of truth and integrity. 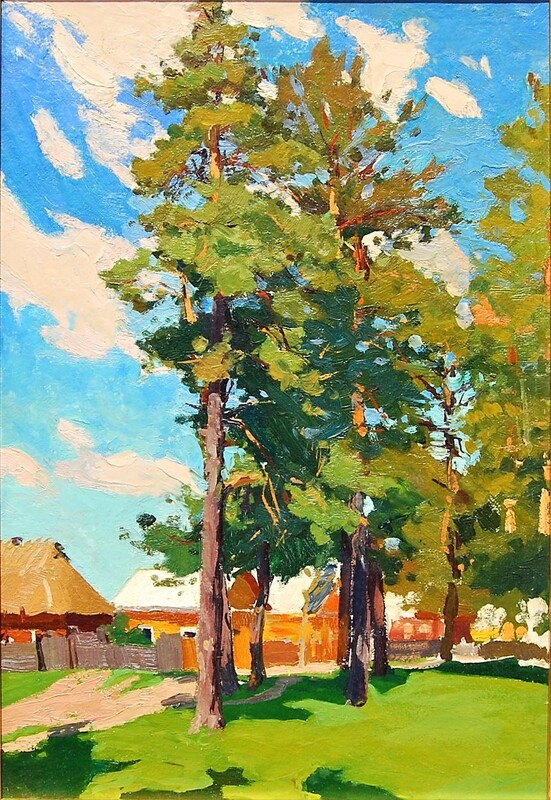 Akinshin captured the gentility, vastness and living breath of the countryside of his native Ukraine and Uzbekistan where he studied. For Akinshin's collectors, his work with local landscapes provides a special touch--capturing the particular light and landmarks of nature. Finding the local peculiarities and uniqueness of landscapes--became the main genre of his creative work. In this work Akinshin combines the spontaneity of a one time plein air outing together with the bright, particularly Ukrainian, colors that are noted in many artists of the period. Mikhail Vasilievich Akinshin brings a vibrancy and spirit to this piece which marks it as a classic. Mikhail V. Akinshin, "Outskirts of the Village"
We invite you to participate in this month's auction and thank everyone who placed bids last month. This is a rare chance to add a beautiful work by a highly regarded artist to your collection. Estimated at $3,000 to $4,000, the current high bid is just $750! The next bid is $1,000, followed by minimum bidding increments of $250. Remember, there is no reserve, at the end of the auction the high bid wins! Bids will be taken via telephone, or e-mail until 7:00 pm MST, Thursday November 30th. Follow all the bidding updates on the Gallery's website. -Mikhail Vasilievich Akinshin was born on the 18th February,1927 in the Kursk region (Russia). -In 1951, he graduated from the Tashkent Art School. -In 1962 he graduated from Kiev State Art Institute. -Since 1965, Akinshin participated in numerous regional and national art exhibitions. -In 1968, he became a member of the Union of Artists of the USSR. -In 2012, at the Zaporozhye Regional Art Museum was held the exhibition of the paintings by Akinshin "From Voznesenka to Samarkand", dedicated to the 85th anniversary of the painter's birth. -Paintings by Akinshin are imbued with philosophical calmness and wisdom. -He died on the 22th July,1982. -1980", by Matthew Cullerne Brown. -Artworks by Akinshin are represented in museum and private collections in Ukraine, Russia, Uzbekistan, France, Switzerland, UK, USA and Canada. Mikhail Vasilievich Akinshin was born on February 18, 1927 in the village Lomovo, Kursk Region into a peasant's family. In 1951 M.V. Akinshin finished the Tashkent Art School. For a year he taught drawing at school. In 1953 he moved to the town of Zaporozhye and since this time has worked as a professional artist. The artist travels often and has visited many places of our country. Everywhere, he tries to see and reproduce characteristic features of the terrain and its coloring. At the same time, M.V. Akinshin emphasizes skillfully his creative projects and in doing so retains peculiarities of his pictorial vision. The artist is especially carried away with diversity of our life, with fast rhythms and dynamics of contemporaneous. Probably, because of this, the local landscape became the main genre of his creative work. Among landscapes created by M.V. Akinshin from 1968 to 1970, it is necessary to mention the picture titled "A Northern Little Town - Velikiy Ustyug". Here the artist's beloved composition device is used -- high horizon. It gave the artist the opportunity to show the place from the bird's eye view. The attention is attracted to the originality of the old town. However, the artist does not consistently repeat this skillfully found method. For example, in the other landscape "Evening", the same place is represented in a different way. Here the view is from below with sharp color contrasts of bright red and orange buildings against the blue sky background. The artist shows a close-up of several buildings in major optimistic combinations with the Old Russian architecture. He gives much attention to the work on studies during yearly trips over towns of our country. His paintings are not simply enlarged studies, not merely a mechanical transfer of a motif but laborious work on assertions of his views, image bearing executions of reality filled with personal feelings, emotional experiences and thoughts. The landscape "Summer" which is in Zaporozhye Art Museum should also be attributed to the best of his works. Having reached the creative maturity, Mikhail Vasilievich Akinshin peers into life fixedly and represents it more truthfully and deeply.